This is the first of my Calendar Units! This is a such an important life skill! 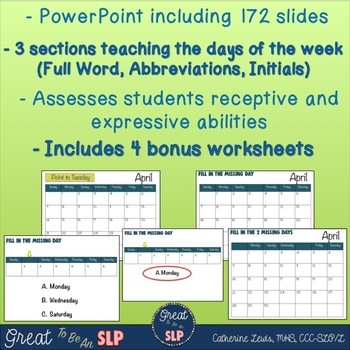 It focuses on the days of the week and includes 172 slides of lessons for practice. It also comes with 4 worksheets. This is a PowerPoint file that I use on a Smart board with my students. I made this unit for some of my middle school students. I realized that some of my students really struggle with temporal concepts, including the days of the week. This download has 3 different lessons in 1 PowerPoint file and 4 handouts. The slides are broken down by the days of the week spelled out, the abbreviations of the days of the week, and the first initials of the days of the week. I did this because some of my students had no problem with these lessons when the whole day was spelled out. However, once it got to the abbreviations and initials, they struggled. 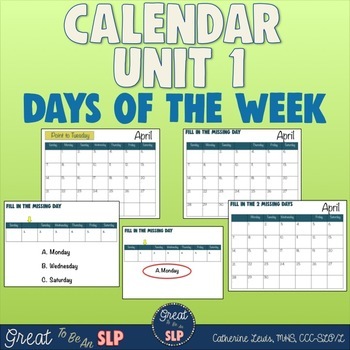 There are receptive and expressive tasks included to make sure the students fully understand the days of the week. Check out the preview to get an idea of what is included!